The Athletics Department has worked together with the Office of Environmental Policy to promote recycling at all of its sports venues since 2008. 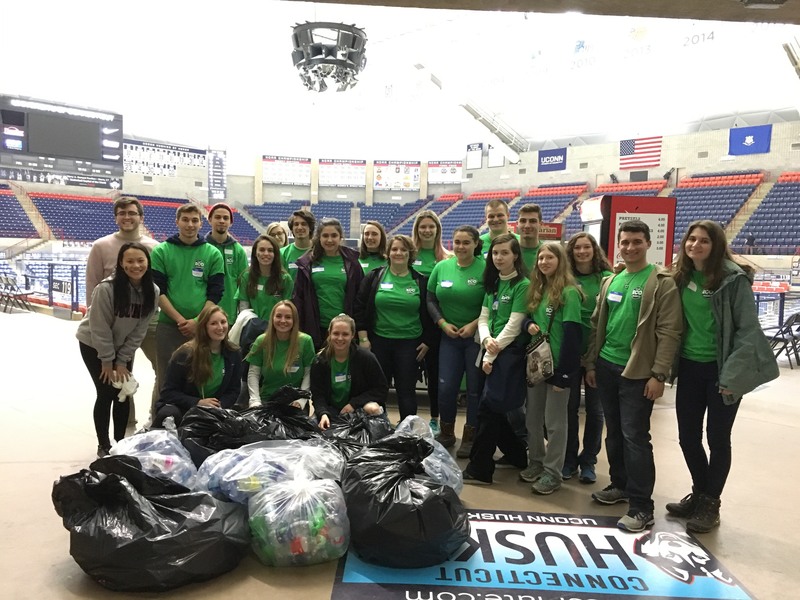 Each year, students from the EcoHusky student group and EcoHouse living and learning community have been invited to football, men's basketball, and women's basketball games to encourage fans to recycle, which have been dubbed the Green Game Days. The Office of Environmental Policy, EcoHusky, EcoHouse, and UConn Athletics combined forces under the lights at Gampel Pavillion to put on Green Game Day. This event promoted environmental stewardship while contributing to the festive atmosphere of a college basketball game. Volunteers advertised campus sustainability at the doors and "manned the cans", asking fans to recycle. A total of 584 and 510 bottles were collected at the women's and men's basketball games respectively. These bottles were all recycled for a total profit of $54.70, which was donated directly to the Campus Sustainability Fund.